Whales, dolphins and other marine mammals remain at the forefront of our imagination. On the one hand, we would have read about the thousands that were brutally killed in whaling operations. On the other, given their sociality and interaction with humans, many of us have read anecdotal accounts of their ‘friendliness’ and intelligence. But though they have been part of human folklore and mythology for centuries or even millennia, most of us rarely if ever get to see them in the wild. Personally, a chance encounter with a humpback whale off the west coast of Mexico, slapping the water with its tail fluke less than 50 metres from our boat, is not a sight I am likely to forget. development, towards finding conservation solutions. 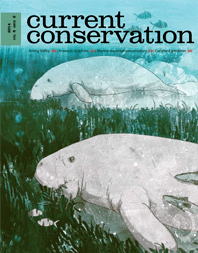 Elrika D’ Souza writes about her work on the foraging ecology of dugongs in the Andaman Islands, and Diya Das interviews her about a recent publication. Kathleen Stafford and Mark Baumgartner write about methods for studying marine mammals and the role that such research plays in conservation. We also carry a photo-essay on Areng Valley, a biologically rich area in Cambodia, which has recently been threatened by development projects.